How Does the World Look Like Through a Rotating Window? 3The Institute of Optics and Department of Physics and Astronomy, University of Rochester, USA. What do you expect to see if you look through a window spinning at faster and faster speeds? According to the theory by Augustin-Jean Fresnel the image is predicted to be dragged along with the window and should be rotated ever so slightly. Unfortunately under normal conditions the rotation angle is so minute that it cannot be observed by eye. At the Optics Group at Glasgow University we have slowed down light to around the speed of sound during its passage through a ruby window spinning at 30 Hz. This increases the dragging effect a million fold and we can rotate an image by 5 degrees . The speed of light is constant only in vacuum. Once it enters a material, its velocity decreases, and it can be dragged along with the material – a phenomenon first predicted by Fresnel in 1818 . An experiment 50 years later investigated the longitudinal drag of light in an ingenious experiment shining light through tubes of water flowing along or against the propagation of the light . Similarly, spinning a window as fast as possible should drag the light in the transverse direction and rotate the view ever so slightly . The rotation angle is predicted to increase with the thickness of the material, with the spinning speed and with the refractive index. However, even if the window is spinning as fast as a dentist’s drill, this rotation is too small to be observed – in the order or a millionth of a degree. We overcame this problem by vastly increasing the refractive index, to slow the light down to that of the speed of sound. In our experiment we used a ruby rod spinning at up to 30 Hz as our “window” and an elliptical light beam as “image.” This increased the refractive group index to around one million, or in other words, slowed down the light to roughly the speed of sound. Under these conditions, the light spent long enough within the rotating ruby so the transmitted image was dragged by up to 5 degrees. Fig.1 An intense line of laser light at 532nm is transmitted through a 10cm long ruby rod, spinning at ±30 Hz. 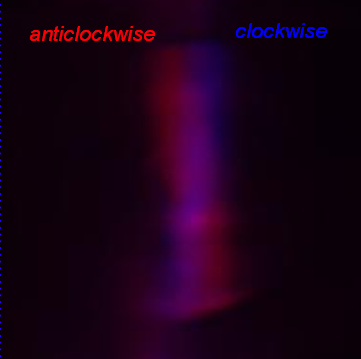 The false color images show the light for an anticlockwise (red) and clockwise (blue) spinning of the ruby rod, rotated by about ±5 degrees compared to the image seen through a stationary crystal. Ruby is a crystal with an extremely long upper-state lifetime of about 20 ms. (This long life-time of ruby was employed in the first laser, as it allows the build-up of population inversion and laser action.) We used the technique of “coherent population oscillations” pioneered by our co-worker Robert Boyd to produce slow light in ruby . Because of the long lifetime, the absorption of ruby changes rapidly over a frequency range of around 36 Hz. The narrow absorption line is linked via Kramers-Kronig relations to a very rapid variation of the refractive index, and hence to a very large group index of the order of one million. In principle an intense pump laser could excite this transition, thereby generating a very narrow frequency hole, which could then be probed with a weak probe laser. Instead, we generate “pump” and “probe” with a single laser, using an intensity-modulated beam. The modulation components experience then an extremely high group index. In our case, the elliptical intensity profile shining onto the ruby rod produced the required intensity modulation and is therefore slowed down. At the same time, the elliptical beam allowed us to define the orientation of our image and measure the rotation of its major axis as a function of how fast the ruby window was spinning. In a control experiment under better defined conditions we have studied the rotation of an elliptical light beam (aspect ratio of 2) through a 6mm thick ruby window and found good agreement of the image rotation with a model based on slow light under coherent population oscillations. Fig.2 Transmitting an elliptical beam through a spinning rod produces locally a modulation in the light intensity which in turn modulates the number of atoms in the ruby crystal driven to the excited state. This generates a delay of the intensity transmitted through the crystal which depends on the rotation speed. The left image shows the calculated delay of the intensity modulation for an input beam power of 1W (blue curve) and 2W (red curve) respectively. The corresponding rotation of the orientation angle is the product of the time delay with the rotation speed, shown on the right. Our experiments have shown that light can indeed be dragged along by a spinning window resulting in an image rotation – just as Fresnel predicted 200 years ago. This effect may also be useful to store and manipulate quantum images. The rotational drag applies not only for classical images, but also for single photons, keeping both intensity and phase profile intact. We are looking into the option to rotate a more complicated image by arbitrary angles in order to encode, store and manipulate quantum information. S Franke-Arnold, G Gibson, R W Boyd, and M J Padgett, “Rotary Photon Drag Enhanced by a Slow Light Medium”, Science 333, 65-67 (2011). Abstract. A Fresnel, "Lettre d’Augustin Fresnel à François Arago sur l’influence du mouvement terrestre dans quelques phénomènes d’optique", Annales de chimie et de physique 9: 57 (1818). H. Fizeau, “On the effect of the motion of a body upon the velocity with which it is traversed by light”, Phil. Mag. 19 245 (1860). J Leach, A J Wright, J B Götte, J M Girkin, L Allen, S Franke-Arnold, S M Barnett, and M J Padgett, “‘Aether Drag’ and Moving Images”, Phys Rev Lett 100, 153902 (2008). Abstract. M S Bigelow, N N Lepeshkin and R W Boyd “Observation of Ultraslow Light Propagation in a Ruby Crystal at Room Temperature”, Phys Rev Lett 90, 113903 (2003). Abstract; M S Bigelow, N N Lepeshkin and R W Boyd “Superluminal and slow light propagation in a room-temperature solid”, Science 301, 200 (2003). Abstract.